ed brick walls. The menu is small, simple. I love it there – it feels like New York to me. The guys see me walk in and after a big hello, one of them turns to the kitchen and yells “Spicy Angel!” The portions are huge, but I usually manage to polish off the whole plate. Any leftovers go back to the office for tomorrow’s lunch heated in a coffee mug. When done properly, this dish will take you to Italy with every bite. We honeymooned in Italy for two weeks and I always say we didn’t do it right. It was summer, it was hot. The Ducati shop was closed, because the shopkeepers were away on their own holidays. Most importantly, I wasn’t tempted to buy any shoes. We plan to go back someday and show the world to our beautiful little sweetheart. The Grotta Palazzese restaurant is already on our itinerary, candlelit tables lining a cliff overlooking the waves. I can’t wait. Spicy Angel is arrabiata over capellini, red pepper dusted tomato marinara sauce served over delicate angel-hair pasta. Arrabbiata is Italian for angry which refers to the heat of the chilis in the marinara sauce. The best sauce strikes a good balance between salty, sweet, tangy and spicy. It should be hot enough to tickle the tongue, not bring tears to your eyes. Whether you have an unnatural fear of vampires or not, garlic overload is compulsory.If you are what you eat, then I want to be a Spicy Angel. It really is the best paradox. 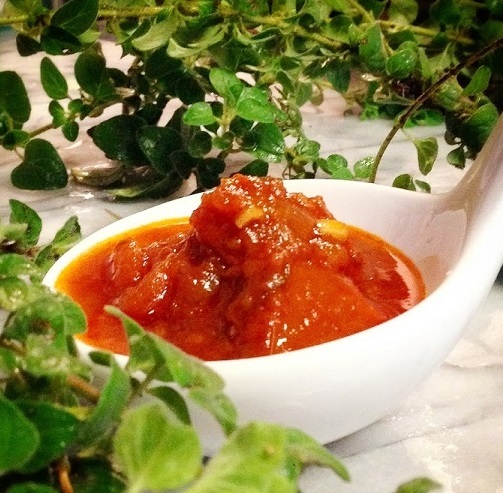 What will get you there is a very simple marinara sauce recipe that dates back to 16th Century Naples when the Spanish introduced the New World fruit to the Italians. The tomato originally hails from the Andes and was introduced as food by the people of Mexico. It is also important to note that Mexico is the birthplace of chocolate (circa 1900BC). We owe a lot to the people of Mexico. consumption. The answer varies depending on whom you ask. The fix is to choose jarred tomatoes over canned, but finding them isn’t always easy. Jarred tomatoes, especially San Marzanos are elusive. So, I have resolved to stock up on glass jars when I see them, but get cans as needed. Unless you eat a big bowl of pasta marinara every night, you should be safe. Whole peeled tomatoes are best. Use a clean pair of kitchen shears to cut them into big chunks. Pasta is quick, comforting and perfect for busy weeknights. Cooking pasta is simple, but also something of an art. It really isn’t hard to do. The most common mistake is adding oil to the water, which is something I used to do routinely, thinking it would help keep the pasta from sticking. What it actually does is make the sauce slide right off the noodles. The only thing the past water needs is a generous amount of salt. The salt flavors the pasta, but, more importantly, helps keep the delicate noodles from breaking in the boiling water. Be sure to cook your pasta al-dente as it will continue to cook in the sauce. Always serve pasta in a bowl to help keep it warm longer. If it isn’t good enough to drink, it doesn’t belong in your sauce. The subtle flavor of this particular arrabbiata comes from the marsala, Sicily’s version of sherry, which adds an effortless touch of class to ordinary pa sta sauce. If you cannot find marsala, use sherry. I have even made it with a splash of sweet vermouth. It came out perfectly each time. If you cannot get either (or be bothered to leave the house), just add a splash of red wine. Just make sure it is good quality. If it isn’t good enough to drink it doesn’t belong in your sauce. Be sure to taste your sauce several times during the simmer to adjust the salt, sweet, heat, tang to your liking. This is the stuff they serve for supper in Heaven. It has to be. No marinara is more tasty. You will not be able to stop eating. You can use any kind of pasta you prefer, but I like capellini (angel hair). Then again, maybe you should just toss the pasta out the window and get yourself a nice, fresh loaf of crusty Italian bread. Pour a big bowl of the sauce and just dip that bread into it and chomp on. It’s that good. A word of warning: This stuff often gives me heartburn, which is not a reflection on the recipe, but rather the speed at which I shovel it into my mouth. Of course, that never stops me from licking the plate clean. But, don’t be a hero – have the Alka Seltzer handy, just in case. This recipe makes a boatload of sauce, which i s great if you’re feeding a crowd. If not, it freezes beautifully. Divide the leftovers into sandwich bags and toss them into the freezer for a busy weeknight meal. Garlic breath is quite useful in keeping vampires at bay. If you are more concerned about your breath than vampires, drink a cup of black tea after dinner to eliminate the offensive smell. This marinara sauce comes together quickly, in less than 30 minutes. In fact, just yesterday, I whipped up a batch for lunch. However, the longer the sauce sits on a low, gentle simmer, the better it gets. The flavors develop and become richer with time. Make a big pot and freeze the surplus. Generous souls will be inclined to share this sauce with friends and neighbors, but after tasting it, they may hesitate to give any of it away. Tonight, on your way home from the office, stop at the market and grab a fresh loaf of crusty bread. Then, go straight to the kitchen and whip up this marinara sauce. It is so versatile, it meets everyone’s requirements. Vegans can enjoy it by omitting the Worcestershire and adding creamy cannellini beans for protein. Vegetarians can have it with a dollop of mascarpone or cream cheese on top.Carnivores will love this sauce with everything from rock shrimp to pork. Hell, even an old pair of sea captain’s boots will taste delicious. It’s Friday night and I can tell you right now that by the time I get home, I will not be in the mood to cook dinner. I’d rather play tea-party with my little sweetheart. Spicy Angel is what will be served at the villa this evening. I can whip up the delicious marinara in no time and let my Bertazzoni do the rest while we play upstairs with Daisy”s doll house. Then, all we have to do is cook some pasta and Prego! Dinner is served. Just close your eyes, take a bite and imagine yourself at the grotto in Puglia. Dear Colette, that is one fun blog post! 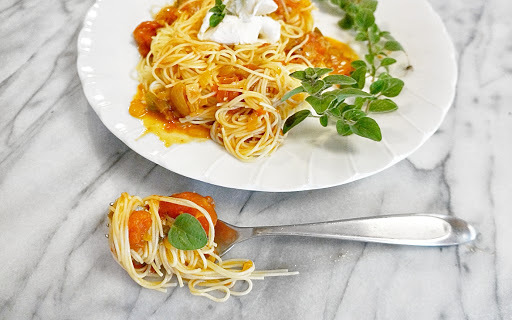 Love the story about your very favorite Italian eatery and the way the waiter always knows that you will stay true to your nature and tend to always order the same (that sounds a bit like me…) – the recipe is most wonderful and I would love to try it rather sooner than later! Now I want to go to Italy for a bit of a vacation and lots of pasta! Thank you for a delightful post & a fabulous recipe! Many hugs and many kisses! I’d love to have a plate of this and imagine I’m sitting in the scene from Italy above! I love pasta, and I love spicy. That’s the Good Life made easy. Hi Coco, you are a great storyteller, love to read your posts, delicious looking pasta! Thanks, sweetie. So glad you enjoyed this one. Hah! This recipe makes a lot of sauce. So that head of garlic isn’t really as much as it seems. Plus drinking black tea will eliminate the stinky garlic breath. This sauce looks fantastic! Nothing beats fresh Italian sauces and this post brought back such found memories of my trips to Italy. Yumm! Thanks for sharing Colette! Your recipes are the best! Hope you try some and let me know what you think, sweetie! This recipe looks amazing and I felt like I had a plate while I read your wonderful post! You should write a cookbook, you’re so talented. Let me know when you do, I want a signed copy!